EB Technology Helps Advance Offset Printing — Energy Sciences, Inc. Written by Brian Sullivan and Alejandro Teodoro. Using less voltage allows for shrinking the overall size of the EB unit. One EB unit, which has an effective drying length of only about 8-10 inches and an overall web path through the machine of less than 6 feet, can allow a press to run 400 meters/min and achieve complete cure instantaneously, with very little heat. Conversely, most 8-color CI flexographic presses require eight interstation dryers as well as an end-of-press dryer to dry the solvent-based inks. 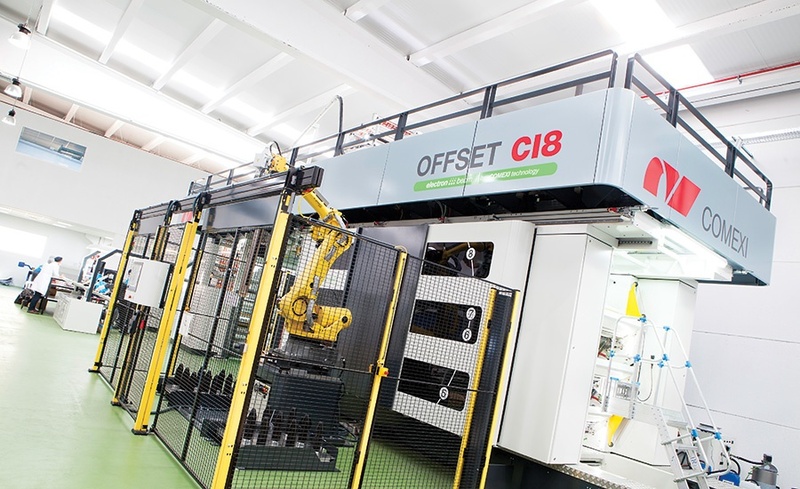 Offset technology provides maximum flexibility in the production process, allowing very short time to market due to the fast in-house prepress that enables users to prepare a new job while the press is still carrying out a previous one. The printing cylinders can be easily exchanged manually (automatic cylinder exchange is available as an option), and all job parameters can be digitally stored and recalled. The pre-setting of mechanical adjustments like ink keys, form-rollers and printing cylinders are automatic. What Comexi Group offers with central impression offset is a press that has fast job changeover, offers a cleaner printing process, is less expensive to operate and eliminates the need for solvent inks for short and medium runs. Let’s not forget offset’s time tested print quality that exceeds rotogravure. ESI EB provides a single cost-effective end-of-press dryer which has the smallest footprint, in addition to the highest uptime and reliability with the lowest operating cost.